your mama is as beautiful as you! You little fashionista! Even at that young age you still have the red beaded necklace going. Stole from mum? LOL. обалденная фотка!!! я обожаю эти старые фотографии. и этот белый свитер - это была мечта всей моей жизни!!!! You're so sweet in this photo!!!! I wanna know who the cockeyed bear-squirrel is. What's that story? 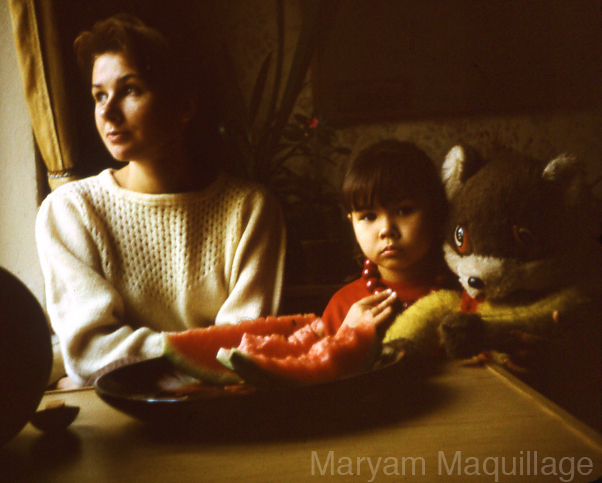 Your mum is gorgeous Maryam and you look adorable! Aww this is soo cute!~ A gorgeous photo! this is a beautiful post! thank you so much for sharing! What a lovely picture! I love seeing old pictures! That's such a sweet photo of you two :) You were (and still are) cute as a button! What a beautiful picture, Maryam. It looks like a painting.. so pretty.